The branding of a designer label is an important aspect for any fashion clothing industry. The best successful branding is the simplicity in its label design which make your customers remember your brand; majority of the famous and important fashion clothing brands only have the logo or corporate identity on the centre of its custom-made woven fabric label. We do not recommend adding the outside lines around the label; the outside lines will take over the brand design. It will also cause a high loss rate of producing defective labels with a non-consistent line thickness in both weaving, and printing production. This is especially in the case of 100 % cotton, printed cotton labels which are hand print (screen print). The outside lines on the label is the design we try not to do in the production. The reason for this is that the printing of outside lines cannot precisely sit on the edges of the label, it will cause a loss rate for about 50% the no-good labels… and you will still get some slightly different line thickness (not consistent line thickness) on each label. For customers who like to have the outside lines print on the label, we would suggest a label design that has at least a gap of 2.5mm from lines to edge of the label. 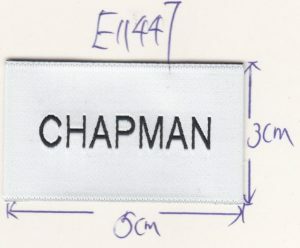 We produce high-quality customized woven clothing labels, ribbons, and swing tags. Contact us on below email for further information on brand woven label design and quote.